In this tutorial I’ll cover all of those subjects and many more. I go over how to use get_the_term_list() and get_post_meta(). All of this information will be vital to understand how to create a shopping cart in WordPress. All of the code follows the video. Great tutorial, very clear and easy to follow! 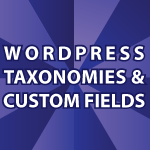 I was looking for a way to integrate my custom taxonomy with the permalink structure. Now i have a menu option with which i can fill posts for music albums. Unfortunately this is not working. The select box appears with the taxonomies and number of post. The link is build (eg: index.php/music_style/disco), but the post can not be found and is not shown. then it is working fine. So the taxonomy under my own made ‘music_albums’ posts is not working with the provided code, but it is does with the normal posts. I made even an taxonomy under the normal posts and that works fine. I am new to this material and i hope i did explain my problem right. And of course i woould be very happy if you could tell me what goes wrong?